Four students from Atwater Elementary School turned out at Thursday night’s Atwater Village Neighborhood Council meeting to ask for $3,000 to help keep the school library open. 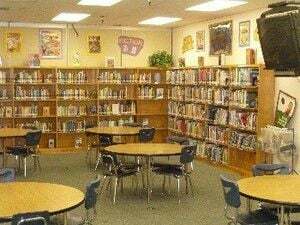 L.A. Unified budget cuts threaten school libraries throughout the district, leaving many schools unable to pay for library aides after today, as reported in the L.A. Times. The Friends of Atwater Elementary has started an online fundraising campaign and set a goal of $15,000 to save the job of the school’s part-time library aide. The Atwater school support group has about about $11,000 – including $5,600 from the online fundraiser – pledged for the library aide. Shelli-Anne Couch, head of The Friends of Atwater Elementary, is collecting more checks from neighborhood businesses today. Neighborhood council board members agreed to hold an emergency Budget and Finance committee meeting next Tuesday, Sept. 27 at 7 p. m. to review and vote on the $3,000 library grant request. According to Treasurer Bruce Fleenor, board approval entails “taking the money we have already approved and re-packaging it so it can be used” for the library. It will take a month for the funds to be released. Anyone interested in making donations can contact Couch at shelliannecouch@gmail.com or contribute online. Representatives from the City of Los Angeles Department of Public works treated board members to a presentation of the history and current state of the city’s sewer system. Residents can expect an increase in sanitation charges of approximately $28 a year as the Sanitation Department implements a ten-year plan to rebuild and repair aging infrastructure. “You want to flush, and you want it to go away,” said C. Bryan Trussell, Civil Engineer Associate, as he explained the risk of sewage backup. Two local establishments received support from the governing board to apply for beer and wine liquor licenses. The owner of 55 Degree Wine will be opening a restaurant at 3111 Glendale Boulevard and is seeking a license for on-premises beer and wine sales. Whole Food for Life Market at 3070 Los Feliz Boulevard proposes to sell beer and wine for off-premises consumption as well as open an outside patio dining area where beer and wine can be ordered by the glass along with food.